10x magnification for more power and performance without sacrificing weight or adding bulk to your field gear. T1028 is rated 4.8 out of 5 by 5. Rated 4 out of 5 by Beach Bum from Steiner Tactical 10x28 Binoculars I was shopping for a pair of lightweight, compact binoculars that were rugged for the field. They were to be used without glasses, have excellent optical quality, and be affordable. Most binoculars in that category are 10x25 that are affordably made in China or un-affordably made in Germany. 10x25 binoculars are typical criticized for poor low light level performance, narrow field of view, and the smaller exit pupil can cause problems for some people's eyes. So, I chose the Steiner Tactical 10x28 as the best compromise. They are not pocket sized as some of the competition claims, unless you are wearing big cargo pockets, and they are not the lightest, but they have a larger objective lens, 28 vs. 25, for better light gathering, and a larger exit pupil, 2.8mm vs. 2.5mm. Their price was also in the mid-range. The binoculars came well packaged with both ocular and objective eye caps, a case, straps for the binoculars and case, and a lens cloth. However, there are no markings for country of manufacture on the product or packaging. Steiner tells me they are made in Germany, but some parts are globally sourced. The binoculars are very well made with good armoring and a smooth focus operation. The HD optics are sharp and bright, with good color and contrast, but not quite to the edges. I can count the individual panes in a window on the shadow side of a house over a mile away and I can see wood grain patterns 100 yards away. However, white trim on a house, a telephone cable that a bird may be sitting on, and a distant mountain top can exhibit chromatic aberrations at the edges, but even more expensive binoculars can do that too. The field of view is narrower than competitive 10x25 binoculars and is limiting. For example, it makes the binoculars more difficult and more critical to set the interpupillary distance, and it is more difficult to pick up and follow a moving object like a bird or a plane, or to scan an area. The larger objective lens should have produced a greater field of view. I found the binoculars to be well balanced, surprisingly easy to hold steady for 10x, and comfortable to hold for extended periods. The winged eye cups are very comfortable, it is easy to maintain a consistent eye relief, and they block distracting light from the eye. I did not test with glasses, but I suspect the eye relief might not be adequate for use with glasses. The ocular lens caps fit over the wings and are attached to one side of the strap, which works well. However, the objective lens caps fall off with normal handling and could get lost. There is no system to attach them. Low light performance is adequate and not objectionable. Although it is not as bright as a larger objective will achieve, the lenses maintain contrast, which allows the ability to see details in the shadows. My eyes can adjust to the different exposure level. On moonlit nights, I can see details in shadows better than I can with the naked eye. Looking at a full moon will be stunningly bright, sharp, and detailed, but I do not recommend it, because it will hurt your eyes. Unfortunately, a light source hitting the objective lens from the side at night can cause internal reflections and washing out. If low light use is a priority over size and weight, I would recommend the larger 42mm objective, because a larger objective lens and larger exit pupil will always give better performance. The case and straps are very good. An improvement over some of the cases Steiner has offered in the past. They are medium duty, well designed, nicely padded, and well stitched, with good materials. They should be very durable in normal use. The extra neck padding on the strap makes the binoculars comfortable to wear for extended periods. You almost forget they are around your neck. The case is oversized, so you do not have to fold up the binoculars or change your settings to put them away. There is generous room to store the straps and probably a granola bar. It will serve most people well, but it is not a tactical grade field case. There are no Molle attachments. I would recommend buying a specialized case for those applications. Although, Steiner calls this their "Tactical" line, the optics should have their hydrophobic "Nano-Protection" coating that is common in today's market and available on some lower cost competitive products. I did not give these binoculars a 5 star rating, because the optics could be better, the field of view should be better, they should have the "Nano-Protection" coating on the lenses, and the lens caps should not fall off. But, don't get me wrong, this is a very good, well rounded product, and a very good value. You would probably have to pay a lot more to get something better. Rated 5 out of 5 by happyman from awesome optics I like to travel and site see, i enjoy the zoo as well as concerts and games. Was looking for a compact and lightweight set of binoculars that i can take anywhere. these are the best that i have tired. low light is superb, waterproof and submersible to 6.6 feet. optics are similar to a 2500.00 pair i tried by a company that also make crystals. i am very happy! Rated 5 out of 5 by ScottDVM from Good product. As expected!!!! Nice glass very clear and crisp. Light weight and nice features. Not great at low light, but better than the average binoculars with this size objectives. I expected that, but wanted a very lightweight pair for long pack in style hunts!!! Would buy again and have recommended to friends!!! Rated 5 out of 5 by Boom3r from Great optics Light weight very clear glass and no distortion at all. By far one of the best binoculars I’ve ever purchased and the best warranty o the market. Rated 5 out of 5 by Chopper from Good optics Had this about a month. Very clear. Seems to work well in low light. How can I obtain a clicloc strap for the T1028, or the clicloc tabs for the T1028 to use with a harness? 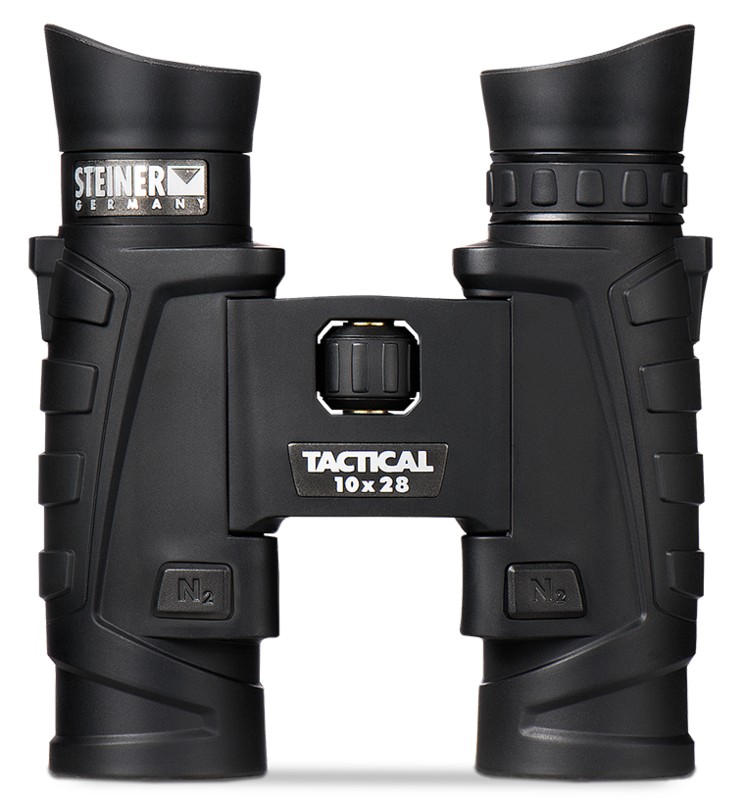 All Steiner binoculars are made in Germany.